The official dress of the Fourth Degree is black tuxedo, white pleated formal shirt, black tie and cummerbund, black shoes and socks, black studs and cuff links, white suspenders and white gloves. The social baldric identifies you as a fellow Sir Knight and must be worn at all social functions. Officers should wear their jewel of office. The service baldric is used whenever the sword is carried. A “simple” American Flag lapel pin should be worn while in uniform. 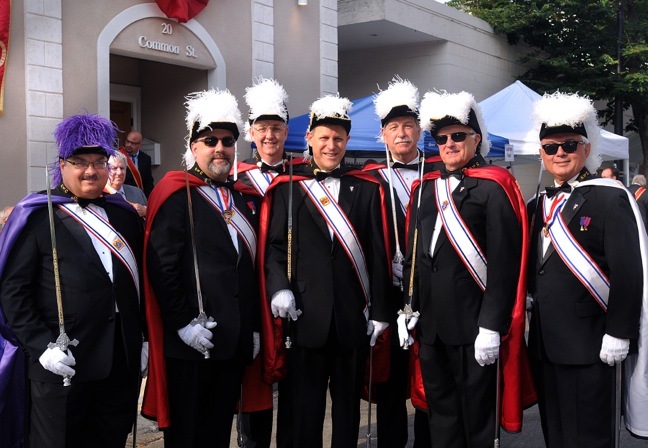 All Fourth Degree members are encouraged to obtain the full regalia which includes the white plumed chapeaux, red lined cape, service baldric and sword. You will then be ready whenever you are called upon to participate.